A new refresh version of Windows Live Movie Maker is released by Microsoft, and the new version of WLMM is been moved out of beta phase. Windows Live Movie Maker is set to replace Windows Movie Maker that included in Windows Vista, and is available as part of Windows Live Essentials as Windows Movie Maker alternative for Windows 7, which does not include any video editing software out of the box. The new Windows Live Movie Maker 2009 is version 14.0.8091.0730. Windows Live Movie Maker now extends support to include high definition (HD) video, in addition to standard definition (SD) video. There are support for additional file formats – including QuickTime formats, AVCHD and .MPEG4, too. The AutoMovie feature allows user to create movies or photo slideshows out of photos and video clips quickly. The new Movie Maker also has more than 60 transitions such as cross-fade, dissolve, pixelate and shatter, 18 pan and zoom options, and 20 visual effects that can apply to photos or videos, plus video trim, split, and fade capabilities. Windows Live Movie Maker also supports direct upload and web publishing of video to YouTube and Facebook through plugin, with support for more video sharing sites available easily by adding plug-ins. User can also use Movie Maker program to burn creation to DVD disc, save the creation in high definition to play on TV, or convert to smaller video resolution (or other HD resolutions of 480i, 720i, 720p and 1080p) and export video to mobile or portable device, or send via email. 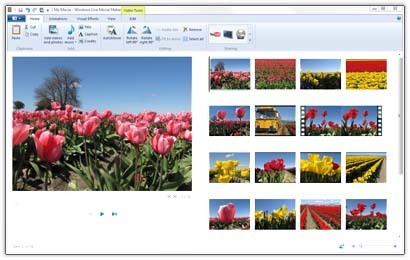 The new Windows Live Movie Maker, which designed specially for Windows 7, also improved on video editing functions, has Ribbon style toolbar similar to Office 2007 Fluent ribbon interface, and supports Windows 7 Jump Lists. Windows Live Movie Maker is available as part of Windows Live Essentials with official download link to unified installer wlsetup-web.exe or wlsetup-all.exe at http://download.live.com/ or http://download.live.com/moviemaker. To know more features of Windows Live Movie Maker with video demonstration, visit official homepage at http://windowslive.com/desktop/moviemaker. The new Windows Live Movie Maker only supports Windows Vista and Windows 7. Windows XP users have to rely on older Windows Movie Maker 2.1, which available through Windows XP SP2 (and Windows XP SP3). Also available is standalone offline installer of Windows Live Movie Maker 14.0.8091.0730, as part of Windows Live 2009 (Wave 3) QFE 2 applications.